After its preview and announcement at summer NAMM in early July 2018, PreSonus has dropped the latest addition to its family of Studio line of interfaces, a model that is also the first of its kind to include a USB-C port. The PreSonus Studio 2|4 is now available to purchase either online, or at a music gear retailer near you for a very reasonable price. The Studio 2|4 is the perfect portable interface for engineers and musicians who don’t have the need for a multitude of inputs – and by a multitude, we mean any more than 2. 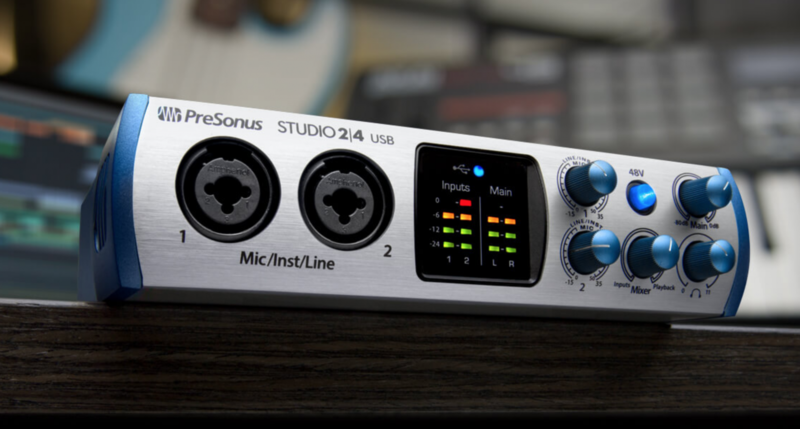 The PreSonus Studio 2|4 can run up to 24-bit/192 kHz audio, and comes equipped with 2 XLR/Instrument/Line combination input jacks which come standard with individual XMAX-L solid-state preamps, and one input for MIDI. Phantom power is also equipable as a whole, but not to either input individually. A ‘mixer’ pot allows you to determine whether you are monitoring the inputs to the interface, the playback signal, or anywhere in between. On the output end are 2 1/4″ output jacks designed for an already line-level signal as well as a MIDI output. Finally, the new interface from PreSonus includes a headphone jack and headphone monitor level knob, a knob for adjusting the main output level, and an LED monitor on the face indicating input and output signal levels as well as a small indicator light for when a device is connected via USB-C. The PreSonus Studio 2|4 has a retail price set at $150, and is available for purchase through Reverb.com. It is an apt portable interface for songwriters or engineers recording simple tracks individually. However, if you wouldn’t consider its USB-C compatibility and MIDI input as hard selling points, you might be better off shaving $50 or more off of your purchase by getting a Scarlett 2i2 interface from Focusrite instead. Providing you the exact same features (except USB-C compatibility and MIDI inputs), processing power, and to some, better-sounding preamps.